F|D|G Flyer Distribution Glasgow is well known for its numerous posters & flyer stands all around Glasgow and Lanarkshire. We can display your promotional materials in locations with high traffic and visibility. This makes them impossible to miss. We can also brand our stands in your company or products colours which add additional WOW impact. 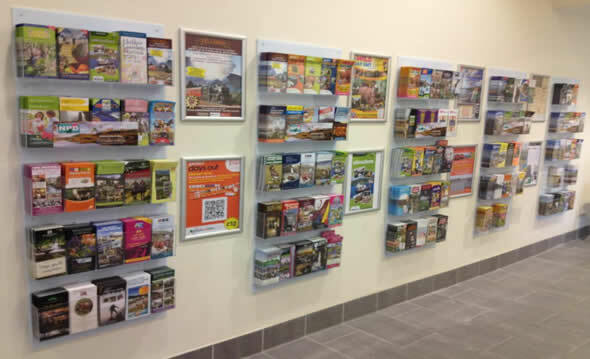 In addition, all our stands and flyer holders and located in the best possible way thus to enhance and interact in the most convenient way with your potential readers. • All travel point in Glasgow, Edinburgh, Aberdeen, Dundee, and Perth & Inverness. (We strive to cover all possible railway stations, airports and bus stations. It’s always great to be everywhere! • Let’s place your promotional materials in the hands of students (we cover all universities, colleges and higher education institutes. Our range of stands is positioned across all establishments for education range from Glasgow to Inverness. • Also, we can offer you to display your leaflets and flyers in various hospitality outlets and leisure tourism hot spots. All various tourism hot spots and hospitality outlets are great places for direct marketing promotions. • Have you noticed that we have thousands of flyers stands all around various commercial premises? Have you interested your local coffee shop and noticed a small flyer pack with many interesting leaflets. Well, that’s us. And we can place your flyer directly into numerous commercial premises across Glasgow and Scotland. Just say the word. If you are interested in advertising with promotional stands, poster displays or flyer packs quickly send us your requirements at sales@flyerdistributionglasgow.co.uk and our special dedicated team leader will be in touch. Providing a dedicated team of creative individuals to enhance your business since 2005. We provide the most effective means of raising brand profile and tailor our services to getting our customers message across to their target audience. our customers message across to their target audience.